Goldbrand is a unique legendary Neutral support card. It is part of the Core Set. In addition to the card's availability in the Core Set, one copy is obtainable as a reward from Reive's Wrath. 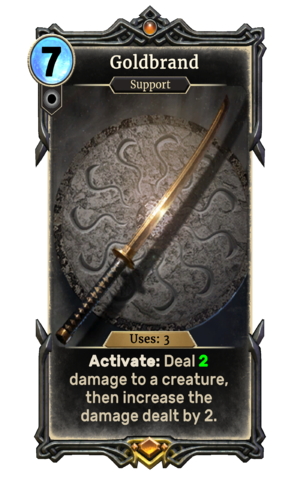 It will be added to the Band of Survivors, Black Marsh Smugglers, Dunmer Avengers, and Imperial Might decks. Goldbrand first appeared in Morrowind, and later reappeared in Oblivion. For historical information, see the lore article. The title The Golden is achieved by dealing 8 damage in one activation of this card; currently the only ways to do so is to use Goldbrand in conjunction with either Tower Alchemist or Cauldron Keeper.